Do this workout in addition to an upper body workout and regular cardio exercise for best results. Begin stretching your groin muscles as soon as you can tolerate a stretch to that area. 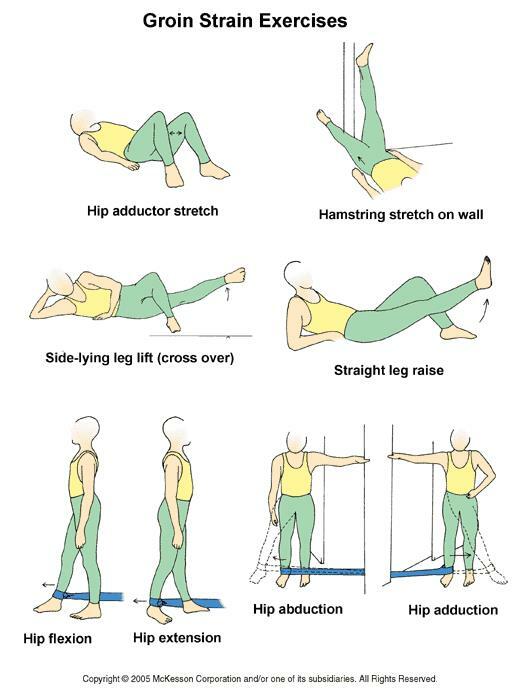 Hip adductor stretch: Lie on your back, bend your knees, and put your feet flat on the floor. Gently spread your knees apart, stretching the muscles on the inside of your thigh. Hold this for 15 to 30 seconds. Repeat 3 times. Hamstring stretch on wall: Lie on your back with your buttocks close to a doorway, and extend your legs straight out in front of you along the floor. Raise the injured leg and rest it against the wall next to the door frame. Your other leg should extend through the doorway. You should feel a stretch in the back of your thigh. Hold this position for 15 to 30 seconds. Repeat 3 times. You may do the next 2 exercises when the pain in the groin muscles decreases. Side-lying leg lift (cross over): Lie on your injured side with your top leg bent and that foot placed in front of the injured leg, which should be kept straight. Raise your injured leg as far as you can comfortably and hold it for 5 seconds. Keep your hips still while you are lifting your leg. Hold this position for 5 seconds and then slowly lower your leg. Do 3 sets of 10. Straight leg raise: Lie on your back with your legs straight out in front of you. Tighten up the top of your thigh muscle on the injured leg and lift that leg about 8 inches off the floor, keeping the thigh muscle tight throughout. Slowly lower your leg back down to the floor. Do 3 sets of 10. When the leg lifts become easy, it is time to start strengthening your thigh muscles and groin muscles using the elastic tubing exercises. Hip flexion: Stand facing away from a door. Tie a loop in one end of a piece of elastic tubing and put it around your injured ankle. Tie a knot in the other end of the tubing and shut the knot in the door near the bottom. Tighten up the front of your thigh muscle and bring your leg forward, keeping your knee straight. Do 3 sets of 10. Resisted hip extension: Stand facing a door with elastic tubing tied around the ankle on your injured side. Knot the other end of the tubing and shut the knot in the door. Pull your leg straight back, keeping your knee straight. Make sure you do not lean forward. Do 3 sets of 10. Hip abduction (with elastic tubing): Stand sideways near a doorway with your uninjured side closest to the door. Tie elastic tubing around the ankle on your injured side. Knot the other end of the tubing and close the knot in the door. Extend your leg out to the side, keeping your knee straight. Return to the starting position. Do 3 sets of 10. To challenge yourself, move farther away from the door. Hip adduction: Tie a loop in one end of the tubing and slip the loop around the ankle of your injured side. Make a knot in the other end of the tubing and close the knot in a door. Stand sideways to the door, with your uninjured leg away from the door. Bring your injured leg across your body sideways, crossing over your uninjured leg and stretching the tubing. Return to the starting position. Do 3 sets of 10. Adductor isometrics: Lying with knees bent place folded pillow between knees and gently squeeze knees together. Hold 3-5 seconds and repeat 10 times. Submaximal contraction of about 75% in the early stages of a groin strain. This can also be performed with the knees straight to bias other adductor muscles.